Here at Skiddaw View we know that people visit the Lake District to enjoy the natural environment. As a result we take necessary steps to minimise the long term impact of our operations and also sustain and improve our natural surroundings without imposing upon your holiday experience. We seek to minimise our consumption of energy by utilising low energy lighting and having lights controlled by movement or light sensors where practical. We provide recycling opportunities on the park for glass, tin, plastic, paper and food waste. We try to use as much bio friendly cleaning products where possible when cleaning. Over the past few years we have planted over four thousand trees and shrubs around the park, planting new trees and shrubs is an ongoing program. 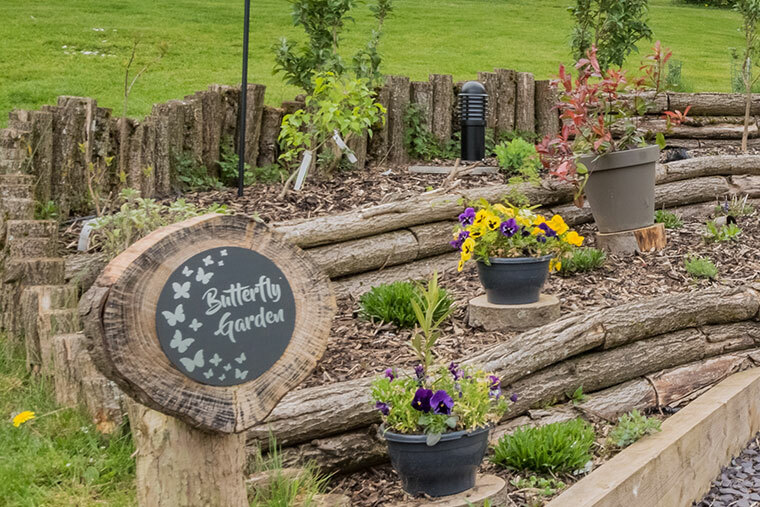 We have various types of planting to encourage wildlife; such as Buddleias to attract butterflies, Holly to encourage small birds and different types of hedgerows such as Beech and Hawthorn to make homes for all kinds of wild life. We have installed various types of bird boxes around the park as well as bat and owl boxes. Whilst much of the park requires the grass etc to be kept short where possible we do allow grass and hedges to grow as this too encourages local wildlife. Frequent visitors to the park are rabbit’s, hare, frogs, toads, small garden birds like sparrow & chaffinch, sparrow hawk, kestrel & woodpecker. Our conservation efforts have been recognised by the David Bellamy Conservation Award winning gold consecutively since 2006. We continue to work hard to retain this award in future years. One of the Red Squirrels spotted here at Skiddaw View. Skiddaw View Holiday Home Park is proud to announce (after a number of rumoured sightings) we have red squirrels on the park with photographic evidence. Skiddaw View has also consulted with the Red Squirrel Conservation Partnership and after which we have installed a number of nesting boxes and feeding stations in various locations around the park, to encourage the squirrels stay. We strongly encourage guests to recycle while staying with us, we have facilities for paper, glass, cans and a compost bin where guests can dispose of bio degradable products like teabags, fruit & vegetable peelings. At Skiddaw View we encourage recycling by offering facilities to recycle: glass, paper, tin, plastic and compost facilities. By communicating with us electronically you help to reduce the amount of printed materials we produce. Buying locally (including the free range eggs on the park) and travelling via the local bus links helps to reduce effects of travelling in the area. Thank you for your understanding regarding these issues. We are continually striving to make improvements in the operation of the park to lessen our impact on the surrounds and generally make the park a haven for wildlife. We want future generations to enjoy the countryside as we do.